An easy and efficient method for backing up/restoring either all one's macros and/or just selected macros. I also have long wanted an easy KM Macro Backup/Restore system. 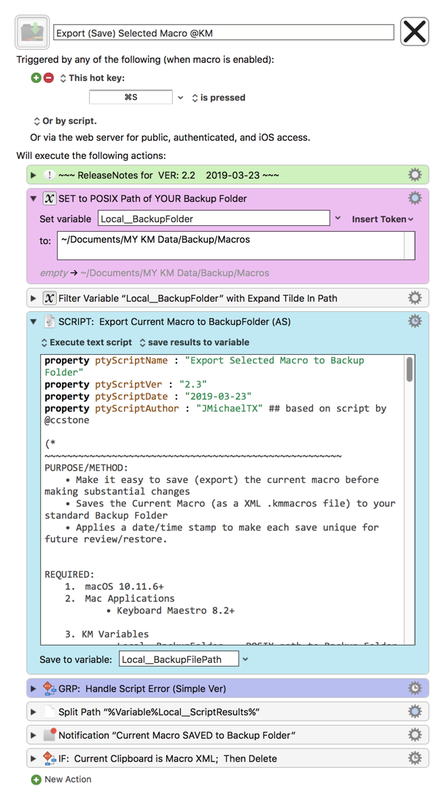 So, in collaboration with Chris @ccstone, we developed the backup script, and Macro. I have to say this runs very very fast, taking << 1 sec. See below for how to use, and examples of output. Note: This Macro was uploaded in a DISABLED state. You must enable before it can be triggered. a trigger of ⌘S, which is NOT used by the Keyboard Maestro.app. In a Macro Group activated ONLY when KM is frontmost. As always, please feel free to post any questions, issues, and/or suggestions that you may have about this macro. Illegal File Chars ("/" and ":") replaced with "╏"
Make sure you understand what the Macro will do. You are responsible for running the Macro, not me. ?? Assign a Trigger to this maro..
Move this macro to a Macro Group that is only Active when you need this Macro. Set Local__BackupFolder -- POSIX path to folder you want to save all macro backups. While I have given this a modest amout of testing, and to the best of my knowledge will do no harm, I cannot guarantee it. Turn on the KM Debugger from the KM Status Menu, and step through the macro, making sure you understand what it is doing with each Action. Yes. You just need to modify the script to work the the macro selection, or the macro group. Not hard, but I don't have the need or the time to develop at this time. See Scripting the Keyboard Maestro editor for some examples of how to do this.